Friends.. 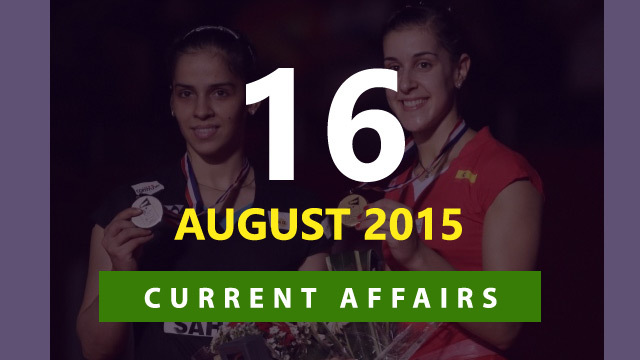 Here is the Important Daily Current Affairs Updates for 16 August 2015. 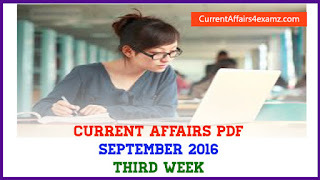 Also Check Our Current Affairs Quiz 2015. --> Saina Nehwal's quest to become the first Indian world champion in badminton ended in heartbreak as she lost in straight games to title holder Carolina Marin in the summit showdown of the mega-event in Jakarta on 16 August 2015. --> The world number two Indian went down 16-21 19-21 to her numero uno nemesis from Spain in a match which lasted 59 minutes. --> It was the second successive loss in a major final for Saina even though the silver medal she settled for is the best performance by an Indian in the showpiece. --> This was India's fifth medal at the World Championship after P V Sindhu clinched the bronze twice in 2013 and 2014 and Jwala Gutta and Ashwini Ponnappa notched up a bronze in women's doubles at the 2011 edition. --> Abhishek Verma gave India a perfect Independence Day gift by clinching the gold medal in the compound men’s individual section to open their account in the Archery World Cup Stage 3 on 15 August 2015. --> World number 18 was at his best in the individual final as he held on to his lead to wrap up the issue 148-145 against Esmaeil Ebadi of Iran. --> Declaration of Kerala as a 'complete digital state' and announcement of a new youth programme in memory of former President, the late APJ Abdul Kalam marked Independence Day celebrations in Kerala. --> With the state making remarkable strides in implementation of various e-governance initiatives, Chief Minister Oommen Chandy declared Kerala as the 'complete digital state'. --> Finance minister Arun Jaitley on 14 August 2015 launched a seven pronged plan-- Indradhanush--to revamp functioning of public sector banks. --> The seven elements include appointments, board of bureau, capitalisation, de-stressing, empowerment, framework of accountability and governance reforms. --> Banks board of bureau will replace existing appointments board. Its members would be appointed in the next six months to be headed by the RBI governnor. --> Banks board bureau would also hold bad assets of public sector banks. --> Ajinkya Rahane became the first fielder in Test history to take eight catches, achieving the feat in the ongoing first cricket match against Sri Lanka. --> Rahane caught Rangana Herath at slip off Amit Mishra to enter the record books after going past five international players -- Yajurvindra Singh (India), Greg Chappell (Australia), Hashan Tilakaratne (Sri Lanka), Stephen Flemimg (New Zealand) and Mathew Hayden (Australia), all of whom took 7 catches in a match. --> The World famous Taj Mahal has become the first historical monument to have an official handle on micro-blogging site Twitter. --> Uttar Pradesh Chief Minister Akhilesh Yadav launched the official twitter account of the monument on 15 August 2015. --> With this Taj Mahal has become the first historical monument in the world to have its own twitter account. --> Within an hour of its launch, the Taj Mahal account got more than 2000 followers. --> Prime Minister Narendra Modi on 16 August 2015 began his two-day trip to the UAE by visiting the historic Sheikh Zayed Grand mosque, the world's third largest. --> After his arrival, PM Modi, on first public engagement in Abu Dhabi, visited the Sheikh Zayed Grand Mosque, a key place of worship in the UAE and known as a masterpiece of Islamic architecture. --> The mosque is third largest in the world after the ones in Mecca and Madina in Saudi Arabia. --> It is named after the founder and first President of the UAE, the late Sheikh Zayed bin Sultan Al Nahyan. --> Modi is the first PM to visit UAE in 34 years.